Cedar shake siding is a popular exterior material for homeowners who prefer a rustic appearance. Particularly cost effective in areas such as the Pacific Northwest, where cedar is plentiful, cedar also resists insect damage, warping, and rot. Cedar shake siding is one of a variety of cedar siding products. Shake siding is distinguished by being made up of small pieces of cedar that are attached to an exterior wall in a shingle formation. This enhances the rustic appearance of the cedar, but also means that installing shake siding is much more labor intensive than using a different wood siding type. A cedar shake is a wedge-shaped piece of wood that is installed vertically in long rows. Most of the time, the face of a shake is split, not sawed. Some manufacturers, however, offer both options, but the split face is considered more traditional. Splitting the shake also emphasizes the grooves in the wood, enhancing the appearance of the overall shingle. The face of a split shake, however, is much rougher than a sawed face shake. Cedar siding has several clear advantages when compared to other wood siding options available. Warping is a common problem with many wood products. However, cedar is less likely to split, warp, or cup when compared to other woods. Ease of workability often causes lower quotes from contractors that enjoy working with cedar. Cedar, if properly seasoned, also shrinks far less than other types of wood. This makes it easy to install when having a uniform appearance with few gaps is key. Fewer gaps often means better exterior protection for your home. The cedar oil present in the wood is a powerful natural insect repellent. The wood that has the largest concentration of cedar oil is located in the heartwood, making this part of the tree particularly desirable for exterior use. 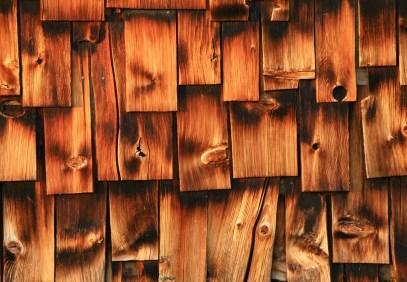 Cedar oil also prevents rot within the wood. Many homeowners also seek heartwood cedar for use in spas or other areas exposed to great amounts of humidity. Sealing is not necessary unless the cedar touches the ground. In order to judge the quality and potential longevity of cedar wood, grades have been introduced to help inform consumers. Grade A cedar is considered the best type of lumber, but it is far more expensive than other grades. Talk to a professional if budget is a concern when buying cedar siding, sometimes Grade B lumber is appropriate, or even desirable from an aesthetic viewpoint. In addition to grades, cedar is also classified by its appearance into two types. Clear: Clear siding has a smooth uniform appearance with few knots or other visible problems. Grade A clear heartwood siding is the most expensive of all cedar wood types. Grade B has a few imperfections, but is still perfectly acceptable for exterior use. Knotty: Knotty siding is often preferred by homeowners who are considering cedar shake siding. This type of siding does not have particular grades because knots are desired. The best type of cedar siding is called select knotty siding. Select knotty siding is distinguished from other types of knotty siding, because the knots are small and have little effect on the overall stability of the wood. Larger knots may be preferred aesthetically, but can cause problems with the stability of the wood itself. Cedar shake siding can be an excellent exterior finish for many types of homes. However, the prep work to install it may be far greater than other exterior siding options and may require some other exterior home renovations and repairs before installation can begin. Also, for many people, this is not a do it yourself home improvement; a contractor will be required to install the cedar shakes. If budget is a concern, you may want to look for an estimate for exterior house painting instead.